Cacao is one of our favorite items to add to a smoothie. It is rich in flavor bitter by nature but amazing when you add just a touch of sweet creating a balance of bitter-sweet goodness. Cacao was extensively used in early Mesoamerica. Named as the nectar of the gods in ancient times, Cacao nibs were traded like gold among the Aztecs. This is a picture of the Cacao nibs in there raw state. At earthly we like to eat the nibs. When fully dried they are very bitter, have a fatty texture and are stacked with anti-oxidants. They are great as a garnish on top of drinks so you get that crunchy texture.We also enjoy the cacao butter and the cacao powder. These two items are created when the nib is processed. The butter is a healthy fat that repairs the skin, hair and nails. The butter also gives you long lasting energy and soothes the digestive track. While baking you can replace oil or butter with cacao butter and the results are truly amazing. You can also melt the butter slightly and massage it into your skin – not only will you smell good but it repairs stretch marks. Cacao powder is full of anti-oxidants that enliven the endocrine system. In the earthly kitchen instead of eating processed chocolate that has alot of fillers we make our own raw chocolate using 2 part Cacao Powder, 2 parts coconut oil and 2 parts agave. Place all ingredients in blender or kitchen aid and blend until creamy. This raw chocolate is good for you because your body can easily break it down and turn it into super food based energy. Navitas Naturals cacao products are farmed with sustainable practices that support local economies in the Amazon. We invite you to enjoy these ancient foods that are wild harvested to support your modern lifestyle. Check out our recipes below that use cacao powder, cacao nibs, and cacao butter. Pinch of Pink Himalayan Sea Salt. 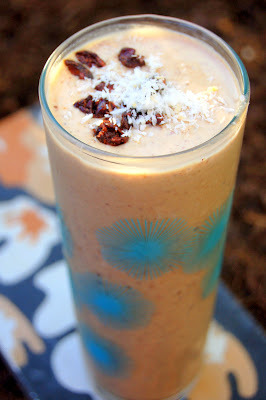 This recipe was the runner up in our smoothie contest and was created by Heather Williamson.